One of the key members of Jumbo Elliott's Irish Pipeline, John Hartnett turns 60 years old today. 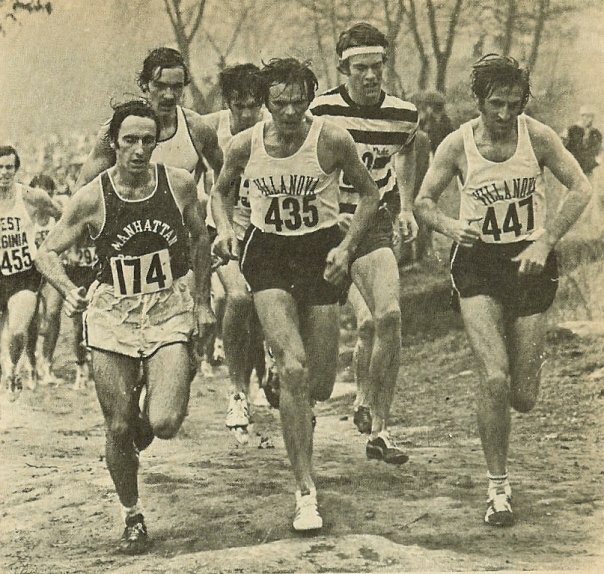 He is shown above leading the 1971 IC4A cross country meet, with Donal Walsh to his left and Marty Liquori a step or two behind. Hartnett broke 4:00 for mile on May 12. 1973 (3:58.3) and had a fine mile PR of 3:54.7. 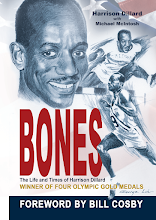 He was the Penn Relays Most Outstanding Performer in 1973. Hartnett had a 3-mile PR of 13:06.4 (#2 on Villanova's all-time list behind Sydney Maree) and a 5000 meter PR of 13:43.4. On Monday, April 16, The Penn Relay Carnival announced the 2001 Penn Relays Wall of Fame Inductees. This year, four individuals and four relay teams will be enshrined in the Wall of Fame at the 107th running of the Penn Relays. The Relays will take place from April 26-28 at historic Franklin Field in Philadelphia. Former Villanova University track & field standout John Hartnett will be one of the four individuals who will be inducted into the Wall of Fame. Hartnett, a 1974 Villanova graduate, was the Outstanding College Athlete of the 1973 Penn Relays when he ran a leg on three championship relay teams including the two mile relay, four mile relay and the DMR. During his three-year Relay career, Hartnett's team won the DMR all three times with Hartnett running the anchor leg each year. In 1974, he ran the anchor leg on the Four Mile Relay and DMR teams that both set Penn Relay Carnival records. Joining Hartnett in this induction class are Meyer Prinstein (Syracuse, 1904), Inez Turner (Vere Tech-Hayes, Jamaica 1991, Southwest Texas State 1995) and John Thomas (Boston University, 1960). The relay teams being inducted include the 1921 Washington (Cedar Rapids, Iowa) High School mile relay, the 1939 University of Pittsburgh mile relay, the 1988 Texas Christian 4x200 meter relay and the 1991 Louisiana State women's shuttle hurdle relay.